The Cat Game Drawing Game is a great compliment to anyone’s game night. It’s easy to play and entertaining. You can either split up into teams and play against each other or you can play individually by having one person draw and everyone else guess the clues to win points for themselves. You pick from three categories: fLICKS (the names of films), PURRsons & PURRfessions (characters from films, television, or books, celebrities or the titles to jobs) or CAT-tivities (everyday activities). Once you pick a category you draw a picture based on the clue on the card you have selected and your teammate or another member of the group has to guess the answer to the drawing. There is just one steadfast rule: there must be a cat in the drawing. Each game box comes with a set of cat cutouts that you place on the board and draw your picture around. Your cat becomes the centerpiece to your drawing. The team or individual with the most guesses wins. The Cat Game Drawing Game is a relatively simple game to understand and use. The game comes with two erasable drawing boards that are covered with an outside film. After you have selected your clue, you pick one of the cats from the cat cutouts that will fit perfectly in your drawing and be able to demonstrate what you are trying to draw. You place the cat cutout underneath the film and smooth out the film until the board is covered. Once you have done that, you are ready to draw and have your team or individual group member start guessing the clue. The game set also comes with two erasable markers and the deck of cards that contain the clues. When you are ready to draw the clue, you draw on the film around the cat that is underneath until someone on your team guesses the correct answer. There are no extra parts, dice, scorecards, pencils, or game boards to handle. It’s extremely minimalistic and easy to store in any game room, bookshelf, or coffee table. Much like its design, The Cat Game Drawing Game is extremely easy and simple to play. There is really only one rule: draw a picture and guess what it is. Other than that, the game promotes groups interacting with each other and having fun together. You and your group can either break into two teams or draw and guess individually. The teams don’t have to be even numbered there just have to be two. Each team gets a drawing board and an erasable marker. Shuffle the deck of cards for each category (fLICKS, PURRsons and PURRfessions, and CAT-tivities), and each team chooses one card from any category. When both teams are ready, start to draw and when your team guesses your clue, you get a point. The first team to reach 20 points wins. There is one other rule at this juncture: if your team guesses first and you’re done, you then have the opportunity to look at the other team’s board and guess their clue. If you guess their clue before they do, you win the point. According to the packaging, The Cat Game Drawing Game is appropriate for ages 16 and older. The reason for this is that some of the clues are deemed not appropriate for children under sixteen years of age. It is also assumed that anyone under the age of sixteen may not be familiar with some of the movies, celebrities, characters, job titles, or activities that are on the cards. There are a lot of universal clues that even children can guess, so if you have a younger child who wants to play a game, it may be to your benefit to go through all the cards in the deck and choose those that are appropriate for the age group playing. A lot of kids get a kick out of the cat cutouts and the fur on the box, so it only seems fair to find a way for them to play as well. There is really no skill level required to play The Cat Game Drawing Game. Whether you can paint like Picasso or your skills are best suited for stick figures, the object of the game is to create a picture that contains enough clues for your team to guess what card you have drawn from the deck. Since the cat is the main focus of every picture, the person doing the drawing is really only responsible for drawing objects around the cat. If for example you drew a card from the Cat-ivities deck that read “playing baseball”, all you would have to do is select a cat cut out where the cat’s paws are up, open, and visible and draw a baseball bat in the hands of your kitty and everyone on your team would be able to guess “playing baseball”. It’s easy enough for virtually anyone to do it. Each erasable marker comes with its own eraser so if you are messing up, just erase it and start all over again. 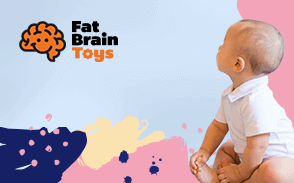 The Cat Game Drawing Game is a good opportunity to learn new facts and information in a fun way while using your imagination. Not every group or individual will know what all the clues are referencing, and not every group or individual will know how to draw a particular clue so, the game becomes an opportunity to learn new facts about movies and entertainment as well as the actors and actresses who star in the films. The same goes for the other categories of careers and activities. Each drawing is a way for players to hear or see something for the first time that they may not have known before opening up the possibility of learning something new. By being able to use your imagination, The Cat Game Drawing game is also an opportunity to collaborate with your team members or group members to see your idea and figure out your drawing in your own creative way. The biggest thing for adults and young adults to learn is the art of drawing. No matter what your skill level, The Cat Game Drawing Game gives all players the chance to create and use their minds to put on to the board their interpretation of the answer. The Cat Game Drawing Game becomes an opportunity for players to do more than just sit around at a party, but to use their minds and imaginations to create something that all will enjoy. 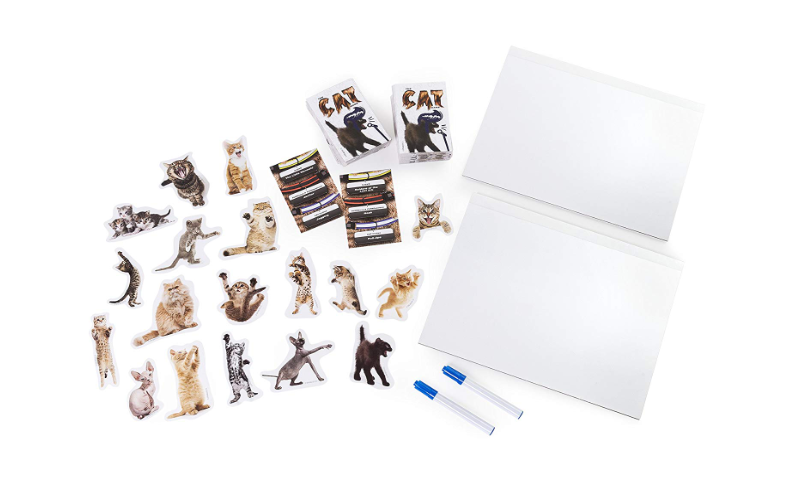 The Cat Game Drawing Game comes with only two erasable boards allowing for there to be two teams at play at any given time. Teams are broken up according to whatever suits the group or whatever rules the group has set. Once the teams have been established then play begins by choosing a designated drawer and that drawer will pull a card from one of the three categories and choosing the proper kitty cutout. That person will do the drawing and everyone else on the team will guess. There is no timer. The person designated to draw keeps drawing until the clue is guessed by either their own team or the opposing team. Whichever team finishes first gets the opportunity to guess the other team’s clue and steal the point. Play continues around the team until everyone has the opportunity to draw. The team with 20 points first wins. The Cat Game Drawing Game can be played one of two ways. You can either break up into teams and try to guess the same clue at the same time and see which team wins first, or you can have one player draw and everyone guesses individually. After each clue is guessed the board is passed around to the next player in a round so that everyone has an equal opportunity to guess clues. This type of play is similar to other group drawing games where the first person to guess the clue correctly wins. The first player to collect five cards is the overall winner. The rules to this type of play can be changed according to the needs or wants of the group. It can be changed so that the first person to hit 10 cards wins or 15 cards or more. With only two rules to the game, it is easy to mold the game to what you want. The Cat Game Drawing Game can be purchased at a decent price and is available in stores or online. There are some sites that are selling the game for almost double the price, so shop around first before purchasing. The manufacturer's price seems correct for what is included in the box, but for this type of game that comes with two markers, two boards, a stack of cards, and about twenty cat cut outs, the price seems fair. Other drawing games that come with more items and timers and cards sell for higher prices, but also the same kinds of games can be sold for a lot less. The Cat Game Drawing Game falls into a good price range and may be found cheaper depending on where you look to buy the game. Also keep in mind that that box is designed with fur, which may up the price a bit. 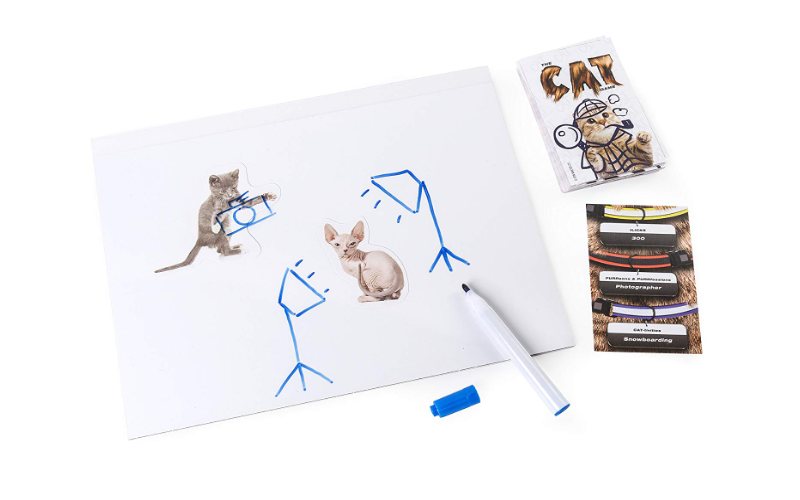 The Cat Game Drawing Game is a good gift idea for anyone who loves cats and loves game night. The box is designed with fake fur enhancing the feline branding. The box is attractive for young kids who are also cat lovers, which makes this a great gift for anyone of any age. Some of the clues may not be appropriate for younger kids, so going through the cards to take out the more adult oriented clues is recommended. The simplicity of the rules and the universality of the clues make this game easy to buy for anyone because it does not hone in on any particular genre like sports or movies or basic trivia that may not be a strong skill set for any one person. The kitschiness of the branding makes this type of game a borderline collector’s item that will compliment the collection of any cat lover and owner. The Cat Game Drawing Game’s design and play rules make it a great addition to anyone’s game night arsenal. 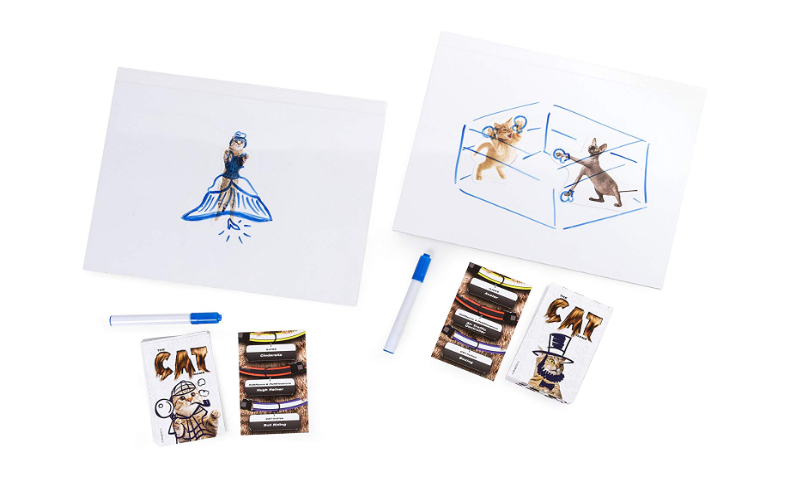 Due to its lightweight and easy storing capabilities, The Cat Game Drawing Game makes it easy to quickly play with a group of friends during a game night where several games are to be played. The time it takes to play the game from beginning to completion is about thirty minutes, which is perfect when other games are involved. It’s a fun way to kick off a game night, but it's not a game that game night should revolve around. Sometimes it’s hard to play in teams because the board is so small and if there are a lot of players it’s hard to crowd around and see what is being drawn. It’s a game that is more suitable for smaller groups of people, maybe four to eight people, but no more than that. 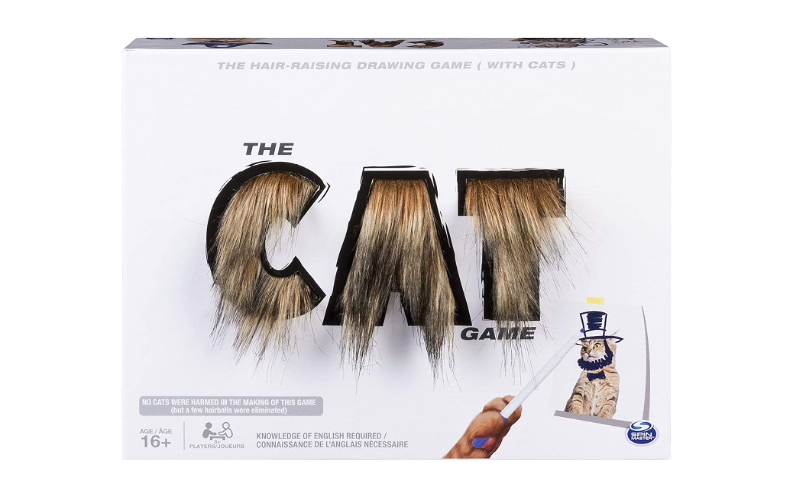 The Cat Game Drawing Game is a good gift idea for the cat collectible aficionado or it is a great idea for game night. Because it doesn’t take a long period of time to play a full game, it adds the right amount of spirit to a gathering of friends without being the central point of the entire night. The Cat Game Drawing Game goes well in a night of other games that create an atmosphere of fun activities. Play can be extended as long as you want making this game an open-ended opportunity to play all night long or for just a few rounds.